Maria Margaretha Brehm. Courtesy of Die St. Mariengemeinde zu Buffalo Grove, Illinois via Raupp Memorial Museum, Buffalo Grove, Illinois. [S11] John J. Weidner, Compiled Birth, Death, 672. [S8] Edwin Weidner, The Weidner History, 14. [S533] 06 Jul 1860 1860 U. S. Census, Arlington Heights, Cook County, Illinois, USA, Wheeling Township, page 153, dwelling 1071, family 1032. [S8] Edwin Weidner, The Weidner History, 7, birth year only; 15, full date and location. [S11] John J. Weidner, Compiled Birth, Death, 672 German state only. 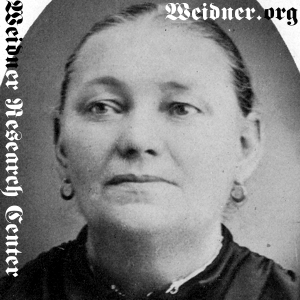 [S533] 06 Jul 1860 1860 U. S. Census, Arlington Heights, Cook County, Illinois, USA, Wheeling Township, page 153, dwelling 1071, family 1032, 1860 census states she was 16 years old and born in Bavaria. [S1022] Christina Weidner, State of Illinois; Department of Public Health - Division of Vital Statistics; Standard Certificate of Death, Birth country only. [S1027] Regina Eva Firnbach, State of Illinois; Department of Public Health - Division of Vital Statistics; Standard Certificate of Death, Birth country only. [S1057] Elizabeth Weidner, Stat of Illinois; Department of Public Health - Division of Vital Statistics; Certificate of Death, Birth country only. [S11] John J. Weidner, Compiled Birth, Death, 35, 623. [S8] Edwin Weidner, The Weidner History, 7, death year only; 15, full date. [S405] The Cemetery Committee, Vernon Township Cemetery Inscriptions, Lake County, Illinois, 99 location only. [S11] John J. Weidner, Compiled Birth, Death, 694, 707. [S11] John J. Weidner, Compiled Birth, Death, 627. [S73] Arlington Heights Herald, 22 Aug 1941, sect. 1, p. 6, col. 2. [S92] Arlington Heights Herald, 01 Oct 1943, sect. 1, p. 2, col. 4. [S118] Arlington Heights Herald, 30 Jul 1948, sect. 1, p. 8, col. 2. [S124] Arlington Heights Herald, 24 Jun 1949, p. 18, col. 6. [S11] John J. Weidner, Compiled Birth, Death, 565. [S1022] Christina Weidner, State of Illinois; Department of Public Health - Division of Vital Statistics; Standard Certificate of Death. [S11] John J. Weidner, Compiled Birth, Death, 635. [S11] John J. Weidner, Compiled Birth, Death, 634. [S8] Edwin Weidner, The Weidner History, 7, birth and death years only. [S405] The Cemetery Committee, Vernon Township Cemetery Inscriptions, Lake County, Illinois, 99. [S11] John J. Weidner, Compiled Birth, Death, 598. [S11] John J. Weidner, Compiled Birth, Death, 663. [S1057] Elizabeth Weidner, Stat of Illinois; Department of Public Health - Division of Vital Statistics; Certificate of Death. [S11] John J. Weidner, Compiled Birth, Death, 588. [S11] John J. Weidner, Compiled Birth, Death, 104, 593. [S1027] Regina Eva Firnbach, State of Illinois; Department of Public Health - Division of Vital Statistics; Standard Certificate of Death. [S11] John J. Weidner, Compiled Birth, Death, 719. [S11] John J. Weidner, Compiled Birth, Death, 563. [S421] Sister Mary Mercedis Weidner, State of Illinois Department of Public Health - Division of Vital Statistics.